As much as Karl Popper’s legacy is strewn with misconceptions about his neoconservative biases and his narrow scientific prejudices in regards to the social science—from his dismissal of Marxism as pseudo-science, psychoanalysis as beyond the pale, and the general explanatory/predictive models of all the social sciences as self-fulfilling prophecies—there is something interesting in his intellectual corpus that deserves rethinking. This is where Justin Cruickshank is in full agreement with my views regarding the value to be distilled, decades later, from Popper’s approach. The Popperian approach has fascinated me for years because of several features that may be reasonably overlooked by his disciples and critics. After listing some of them, I wish to illustrate their significance in the 21st century. To begin with, Popper’s approach to science and politics is normative but not wholly dependent on one’s personal character or integrity; it’s a methodological feature into which scientists are initiated. In this he follows the model set in place a century earlier by Karl Marx and his own approach to the classical depiction of political economy. Though ending his works with messianic-like utopian visions of socialism and communism, Marx should be remembered for his acute critique of Adam Smith’s and David Ricardo’s work on political economy. In this sense, it was the claims for scientific credibility that were at stake. Marx’s genius lay not in his following the model of Hegel—as much as he admired his work—but that of a critic of what counts as science in terms of its objectivity and value-neutrality. Popper, likewise, is a student and critic of what counts as science—from the Vienna Circle to later incarnation of positivism—so that his agenda for the problem of demarcation becomes an agenda for exposing false pretenses and the inherent fallibalism of any inquiry, scientific or not. The Marxian turn of Popper is one laced with an immanent critical approach to the latest claims for scientific credibility in the name of moral fortitude and integrity rather than simply in scientific or pseudo-scientific terms. This means, for example, that his life-long distaste for the inductive and verificationist approach to the production and testing of knowledge claims was as much ethical as cognitive, but not personal in the sense of defaming the character of this or that scientist. The second feature, recalled in several places in Cruickshank’s latest commentary, is his commitment to the fallibalist nature of knowledge. Humans are fallible; nature and reality are not. If there is any give-and-take in the relationship between humans and nature, it’s humans who have to be flexible and change their views, as the hard-core of nature’s reality is somewhat immutable by definition. It’s not that natural phenomena aren’t in flux, as Joseph Agassi (1981) eloquently reminds us of Popper and of our role in studying nature via the tools of scientific inquiry; rather, when the contest between the truth of reality is placed against the putative truths claimed by scientists, it’s the scientists that have to be corrected, no matter their community’s commitment to a particular frame of references, not nature. The whole process of “conjectures and refutations” (Popper 1962), familiar to most 20th-century students of the scientific method, is an ongoing process through which mistakes are corrected and eliminated rather than avoided. This feature, just like the first one mentioned above, is humane and moral through and through: it acknowledges not only human fallibility, but a certain claim for the modesty and humility scientists ought to bring to their observations and studies, to their own claims of knowledge. Honesty and integrity are natural companions to these characteristics because they are accompanied by a moral expectation. The third feature that is linked to the second is that once “claims” are defined as “conjectures,” a lower threshold is set in place for the engagement of the rest of the scientific community. If you recall, Popper and at least some of his students (Agassi the liberal democrat and Paul Feyerabend the anarchist come to mind) insisted on doing away with “gatekeepers” for the sake of a more open and democratic process, even though some regrettably ascribe this posture to him. In this way, they attempt to do away with experts, mentioned by Cruickshank in his piece. It’s not that experts don’t deserve their titles or the designation of knowing more than others in specific areas of inquiry; it’s the political or professional advantage they claim for themselves in an elitist way, as Cruickshank reminds us, and thereby look at others as less worthy. It’s not that scientists shouldn’t be distinguished from non-scientists as Popper distinguishes between science and pseudo-science; instead, that distinction rides on the waves of a greater expectation or demand of the scientists to explicitly outline the criteria according to which their observations aren’t obscure or dogmatic. Unlike the superiority claimed by the clergy of yesteryear, Popper’s demarcation could be explained and even justified; and when the justification fell short, as he claimed was the case with Marx and Freud, full critical exposure was due. Popper had a great deal of respect and admiration for both Marx and Freud, as he spent so much time studying and writing about them; yet he warned us against accepting their authority in areas where it was suspect. The fourth feature that should be recalled in relation to Popper’s legacy is one that deals with faith or belief (about which more later). What distinguishes Popper’s approach from many others of his generation is that for him all belief—in theories and principles, in ideas and scholarship—was of the putative and preliminary kind. It was the kind that could easily be refuted. It was the kind that was suspended in midair until it fell to a solid ground and could be further examined. In short, it was instrumental in a temporal fashion, rather than the permanence expected of religious faith or the faith in the scientific edifice. As a philosopher of science, I see Popper as politically astute and morally driven: he’d tackle critically anyone and anything, regardless of prestige and power, with little regard to how marginal his own critique would remain for years. And finally, I always thought of Popper in terms of the courage displayed by the likes of Spinoza and Marx who had to deal with adversarial conditions on behalf of their own truths and ideas. 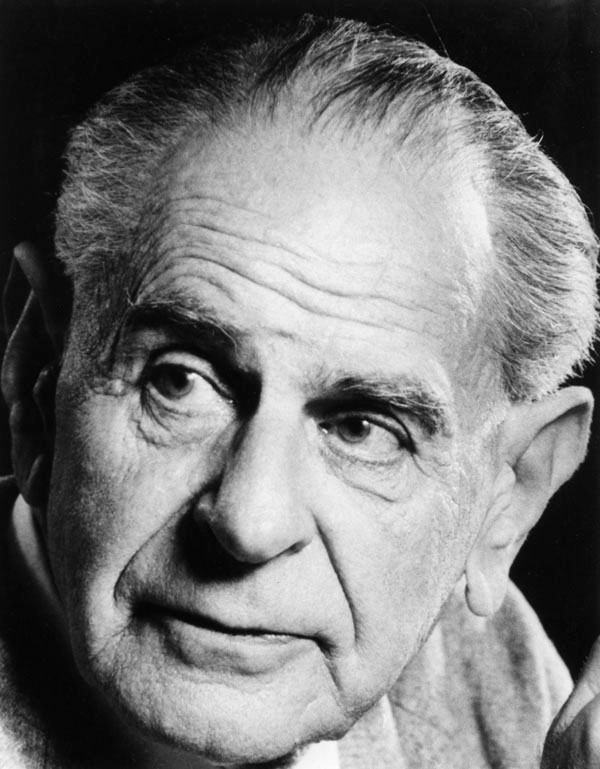 Intellectual and academic courage is the most important lesson I have learned from the writings of Popper, whether I accepted their correctness and validity or not. Once your words are on paper, publicly exposed to any critical evaluation, you are disclosing more than just your thoughts. You could be attacked for being a Jew, for example, or a foreigner; you could be ridiculed for missing a reference or citing the wrong publication year here and there, for the awkwardness of your grammatical phrasing because you are not writing in your native tongue. It’s under the conditions that define one’s work as an outsider that I find intellectual courage to be exposed and admirable. It’s also under these conditions that I have argued, we, as a society, and we, as individuals, must pay the price of being public intellectuals who speak truth to power. What has dawned on me in my own work over the years—and what enticed me to engage in a public correspondence with Cruickshank—are two things. On the one hand, all discussions of scientific matters incorporate tacitly an ethical dimension; and on the other, any progress in the production, distribution, and consumption of knowledge benefits most acutely from a dialectical or dialogic process. The first didn’t quite hit me at first, when methodological debates and the problem of demarcation reigned supreme in my inquiries. But as time has gone by it became quite obvious that at heart scientific questions carry with them—either prior to their inception or conceptualization, definitely during their incubation and formulation, and in many ways after their public introduction—moral principles and convictions, whether of the presumed superiority of an elite (priests or scientists) or the personal undertakings of lone researchers within their respective communities (religious, scientific, or academic institutions). With these realizations in mind, it makes sense to revert to a more thorough discussion of the democratic dialogic, eventually carried out as the dialectics of the 19th and 20th centuries. I will funnel my reflections in light of a particular recent book. Philip Benesch’s The Viennese Socrates indeed does justice to its subtitle: “Karl Popper and the Reconstruction of Progressive Politics.” (2014) On one level, this is a most audacious battle-cry against so-called right-wing apologists who claim Popper’s legacy as their own; on the other, it’s an outrageous response to decades of so-called left-wing dismissal of Popper as a reactionary crusader against Marxism. Perhaps that’s why I like it so much: it outlines a critically rational argument on behalf of a reinterpretation of Popper’s thought in politically progressive terms. This isn’t simply finding a comfortable middle ground for the legacy of Popper’s thought, but a search for the useful intellectual tools left for us by Popper, tools with which we should approach our own frustrations and lamentations concerning contemporary political debates. Popper unnecessarily conflated the Socratic-Platonic distinction in classical philosophy with the liberal-anti-liberal antagonism in contemporary politics. He failed to demonstrate that Plato’s political writings—when taken as a whole, rather than carefully parsed and selected to fit a preconceived hostile interpretation—advance an authoritarian agenda. Similarly, Popper failed to explain how Socrates might be understood to endorse (other than ironically) any program of political action, whether liberal or otherwise. There are those of us, from Agassi (who was his student, assistant, follower, and critic) to myself (2006), who have argued that the Popperian legacy is thoroughly political rather than limited to the affairs of the cloistered scientific community and its ground clearers (as Locke suggested his role was vis-à-vis Newton). Agassi’s ongoing question about the classical demarcation problem that Popper famously reignited was always: for what purpose? Why should we care about it? And the answers were always social and political, moral and psychological. As such, to be brief, to fully understand Popper and the ghosts he fought and the demons he hoped to excise for good is necessarily to contextualize his work in political and moral terms. As Benesch correctly reminds us, Popper’s The Open Society and Its Enemies was considered by him a contribution to the “war effort.” Indeed, a faint hope to fight European fascism with the power of the word; to remind followers and critics alike that the ideas of the past matter, that they remain alive in the actions of future generations. With its negative definition of democracy, this book became a best-seller for decades. But my interest here isn’t Popper’s scholarship—his own and that of his many critics—but his contribution as a public intellectual to the democratic dialogues of his generation. Popper was a public intellectual, no doubt. But comparing him to Socrates is unkind to both. Let me explain. Socrates wasn’t an academic, like Popper, nor had he the advantage of the history of philosophy that followed him, including the ideas of the Enlightenment. Popper, in turn, was a refugee in New Zealand and then UK—Jewish by Nazi standards despite his father’s conversion—unlike Socrates who remained in his home city-state till his death. While Socrates was talking ironically, sarcastically, and of course very seriously in the streets of Athens, Popper was much too reserved for such casual encounters. While Socrates was demanding state subsidy for his future services as he was about to drink the hemlock, Popper was knighted by the Queen. The two couldn’t have been more different on so many levels. Yet, insists Benesch, the one can be seen as the heir of the other, with a few modifications. Socrates, as I suggested (2014), offers two models of public intellectuals: gadflies and philosophers-kings. With typical irony, both models are flawed. Though the latter accounts for the problems of the former—since speaking truth to power becomes an internal affair—these remain distinct and divergent models. Should the intellectual remain an outsider (Julien Benda)? Should the intellectual be an organic insider to affect changes (Antonio Gramsci)? In this landscape, Popper is neither a blogger nor a rapper, but just another academic trying to engage the issues of the day (Edward Said?). How should we assess Popper’s effectiveness as a public intellectual? One criterion can be of courage: he passes with flying colors (like Bertrand Russell), unlike many academic cowards who remained quiet when oppression surrounded them (Thomas Kuhn). The other can be of correctness: once again, he judged fascism correctly (like Raymond Aron)—including the Stalinist horrors many leftists chose to overlook (Jean-Paul Sartre)—but missed the elasticity of capitalism (when following the Keynesian model of the day). And yet another can be of impact: and here he fails miserably, because his discipleship is miniscule by all counts (like Socrates’), and his ideas are rarely discussed in political circle (unless we count the billionaire George Soros). Yes, Popper definitely counts in my catalogue as a public intellectual, a brave academic who was willing to write about the issues of the day, condemning those worthy of condemnation and supporting those deserving support. Did he have some blind spots, just like our dear Socrates? Of course. Was he as open to criticism as his methodology suggests? Personal reports vary, but on the whole the answer is a qualified no. Was he as public as he could have been? The answer here, too, is a qualified no. But maybe I’ll be corrected with additional evidence. In the meantime, I take solace in the herculean effort put forth by Benesch about the potential for political progressive movements that can also draw from Popper. Such movements, as I have lamented for years, can use all the help they can get. So, let’s end with Benesch again: the Socrates offered by Popper was the model of an unyielding critic of the moral failings of society and its political leaders. Should the Left adopt this model it would function as the secular conscience of a democratic society that might otherwise easily become complacent and indifferent to the injustices inflicted upon the poor, the weak, and the oppressed. I fully agree with this assessment, and would like to add that Popper’s most glorious technical idea (found to be false by some) is that the rules of science are but those of the Socratic dialectic, common-sense questions and answers, conjectures and refutations. To turn now back to the dialogue between Cruickshank and myself, what has been enticing is the way in which the first salvo was an unlikely juxtaposition of Popper and Rorty, a Viennese Jewish (though converted) refugee with a patrician American White Anglo-Saxon Protestant, both of whom deserve their notoriety. The point of any dialogue is both to advance knowledge and to find common ground on which to continue the conversation. Socrates used his rhetorical questions to lead the conversation, Popper used a critical stance, and Rorty tried to finesse a pragmatic path that allowed for contingencies. It’s not that Popper and Rorty are made of the same cloth, so to speak, or are part of the same dialogue; but despite their difference, we have found sufficient common features of their ideas and methods to be noteworthy. Likewise, as we have tried over the past few months to demonstrate, even if Cruickshank and I come from different “stables” as sociologists of knowledge used to characterize schools of thought, also we hail now from different continents, we can find discursive commonalities that in their bridging of differences don’t pretend to white-wash them away. Our politics may differ somewhat, between a more radical leftist minority-perspective to more nuanced radicalism of postmodernity; but our conviction that we ought to listen, cajole if needed, and criticize each other when warranted allows us to advance our limited respective interpretation and understanding. Whether Socratic, Hegelian, Marxist, or Frankfurt-School inspired, the dialectic method remains a philosophical staple for its usefulness. It’s a method that is immanent, it cares about what, how, and why something is said, it takes its interlocutor (unlike Socrates) seriously because what is at stake is an important idea or problem. It’s a method that is critical insofar as it looks for and exposes flaws in the position it studies, and insofar as it finds alternative solutions to the one originally proposed, the so-called antithesis (the alternative way of looking at the problem situation). The third step of a synthesis isn’t one that overlooks or minimizes the original critical tension or conflict of positions, but one that allows a suspension of finality in the hope that additional ideas and alternatives will be forthcoming. This last feature, the ongoing or continuous process of the dialectic process, is probably the most attractive part of it because it admits that no finality is at hand (or even possible). The open-endedness of the dialectic invites more participation rather than less; it contrasts itself from other dogmatic methods of inquiry (primarily attributed to religious debates) where an absolutely permanent True answer or solution is presented. Both Popper and Rorty inspire their students and critics to continue the conversation, to be open to critical interpretation that shouldn’t be ad hominems but instead separate the critique of an idea from the critique of its author(s). Whether termed fallibalism or contingency, whether understood more strictly in scientific terms or pragmatic ones, what becomes apparent in reading Popper and Rorty is a richness of references and an incorporation of a variety of sources in order to further the ideals of democracy as a political organization where people are determining their own laws and future and where institutional arrangements would never undermine their inherent right of sovereignty, their power to govern themselves. Cruickshank more than I has come back again and again to the examination of the university as an interesting and relevant case-study for the exploration of the production of knowledge in contemporary culture. In pursuing the institutional settings of the university, and more particularly the neoliberal and conservative dictates of the British Academy since the days of Margaret Thatcher’s governance (1979-1990), he has highlighted not only the inequities of the university model but also its turn from its own ideals to those of neoliberal monetizing. The very notion of the “business of people” is offensive on many fronts, not the least of which is the approach to which knowledge production, distribution, and consumption have to conform. Since he has given lengthy and critical description of the British model in general and his own University of Birmingham in particular, I shall offer some comments from my own situational logic, the University of Colorado, Colorado Springs. There is a long tradition of bemoaning the capitalist intrusion into higher learning. Socrates already railed against the sophists who were accused of making money off their rhetorical skills and catering their arguments to the dictates of their sponsors. Thorstein Veblen noted at the beginning of the last century (1918) that if business interests were to control the university, higher learning, education as we’d like to think about the dissemination of knowledge, would necessarily be compromised. With his journalistic zest and intellectual rigor, he offered one of the first sustained critiques of the compromises the American academy made to the interests of the business and management class. By the end of the 20th century, it was no secret that the academy was nurtured by the financial largesse of the industrial and financial communities, intermixed with substantial contributions from the state—with its own interests that primarily focused on national security (the inception and proliferation of so-called Big Science). James Savage (1999) and Daniel Greenberg (2007) chronicle this intrusion into the affairs of the university system in America as opposed to Clark Kerr (1963) who praised the university as preparation for careers. More specific in this critical trajectory is the devastating report from Philip Mirowski (2011) on the compromises of the scientific community under the pressure of funding sources. What makes his critique and the one offered by Elizabeth Popp Berman, in her Creating the Market University: How Academic Science Became and Economic Engine (2012) so much more informative for our purposes is their articulation of the neoliberal ideology that directs this development in what they see as the decline of the autonomy of the university system. It’s not merely the funding realities that underwrite the university, but it’s the way the university is thought of as an instrument for economic development and progress, as an engine of industrial production and proliferation. In short, instead of being consumed by the Socratic motto that the “unexamined life is not worth living,” or even some religious pretenses of learning for the love of God, higher learning is reduced to a calculation matrix where costs and revenues are to be balanced, where everything is to be measured and assessed in dollars and cents, in allegedly objective and value-neutral ways. This, indeed, is reminiscent of the concerns we already covered in the first section of this essay, and the ones more broadly addressed by Wendy Brown (2015) about the neoliberal hijack of democratic principles and ideals. The “flagship” university in Colorado is the CU system, founded when the territory became a state in 1876; it includes four campuses (Anschutz Medical campus, Boulder, Colorado Springs, and Denver). Since my campus is the most recent to have been established (1965), it’s also the least well-funded. Though grown from around 3,000 students in 1986 (when I joined the faculty) to close to 12,000 students today, this campus receives a state allotment of less than 7% of its budget. In short, it’s a state university by name only. The budgetary burden rests primarily on students’ tuition payments (which increase annually by an average of 5%), indirect cost recovery from grants, and other fees levied on faculty, staff, and students. What makes it a third-rate university is its anemic budget, its lack of resources for faculty and students, and the meager salaries paid across-the-board. Less than 30% of the instruction is by tenure-track (TT) faculty, those with terminal degrees in their disciplines, so that the majority of courses are taught by underpaid and exploited “reserve army of the unemployed,” as Marx reminded us more than a century ago. It’s quite common for a non-tenure-track (NTT) full-time instructor to teach eight courses per year with about 40 students in each course for a total of 320 students. Multiply the number of students by an average course cost of $1,000 and the revenue brought in by this instructor is about $320,000. The average payment to this instructor is between $32,000 and $40,000, while starting TT assistant professors get paid between $55,000 and $100,000 (depending on disciplines, which in turn is justified in terms of the “marketplace”) and teach five to six courses per year. One can clearly appreciate why the proportion of NTT to TT faculty has the trajectory it does: more profits are to be had when instruction costs range around 15% of revenue than when they come close to 35%. The reliance on “lecturers”—part-time adjunct faculty who teach one to three courses per semester—has also increased in our college, for example, since they are paid only $2,625 per course (close to 60% of the cost of NTT Instructors and 25% of TT faculty). Yes, the numbers definitely point to granting no tenure ever, and the filling of universities with the reserved army of the highly-educated unemployed professoriate! Forget about purely intellectual or artistic aspirations or the ideals of autonomous academic institutions of higher learning, as I already outlined over a decade ago (2000). Forget about learning for the sake of it, or for the sake of educating a more engaged citizenry. But if you can’t forget the dictates of the neoliberal business model, if this indeed is the only yardstick by which to measure higher education, then you might as well do it right! What I mean by this is the fact that the managerial class of our universities are clueless about the product they are trying to market and sell—they haven’t been in classrooms for years, and they hardly know what is taught in each discipline; their zeal for career-preparation instruction, input-output assessment of each course (what is its value? ), and job placement overlooks that learning is a life-long endeavor whose value can be judged only here and there when the opportunity lends itself. Having instilled thoughtfulness or a moral compass in one’s heart and mind should be primary in our academic undertakings rather than a secondary byproduct that is never appreciated (because it’s not necessarily accompanied by a monetary reward). I guess the view from this side of the Atlantic unfortunately doesn’t look much differently from the one described by Cruickshank. Perhaps my own use of the word “faith” brought about the last set of comments by Cruickshank about the former Archbishop of Canterbury, Rowan Williams. Perhaps we should recalibrate the discussion here and talk about the positive features that religious institutions may play on a good day (which admittedly is quite rare in this climate of fanatical orthodoxy apparent from Jews and Muslims to Christians of some sects and Sikhs). Sadly, no denomination has the “corner” on vigilant brutality and close-minded hatred of the “other.” But instead of focusing on the negative elements accompanying most institutional religions, we can highlight a few rays of hope. True, no institutional religions are democratic (save the Quakers and some Buddhist sects), but most of them display a sense of communal generosity and charity unseen in most civic democracies. It’s this feature of social justice and the provision of welfare safety nets that endears some religious organizations to me. The way that some religious leaders have allowed their churches to be safe havens for protestors (London) or those who have fought dictatorial regimes (Liberation Theology in Latin America) should remind us of a way in which faith—understood broadly to encompass everything spiritual that transcends the materiality of earthly powers—can be helpful rather than dangerous. But of course this way of framing religious faith takes it away from its theological frameworks and sets it on the level of personal role-models and the resistance to power. It seems to me that the lessons of the likes of Popper, Rorty, and their respective students and critics is one of faith as well, but in their case faith in human integrity and generosity, faith in the ability of ideas and dialogue to overcome brute power and warfare. It’s the faith that put in place institutions such as the United Nations and the International Court of Justice, and it’s the faith that brings academics and intellectuals together in universities and conferences around the world. Cruickshank reminds us to think of those outside the rarified halls of the academy, the working class, the unemployed and underemployed, the refugees who suffer for who they are and where they come from. He reminds us not to limit our conversation to the level of hyperbole or hubris, and to anchor its terms in light of the material conditions that surround us and define our vocabularies and dreams. I wholeheartedly agree with his diagnosis that the least fortunate, in John Rawls terminology, ought to be our focus; I also agree that we should worry about global economic conditions and not only our local ones, as Amartya Sen insists; but I must confess that the conversation has to start somewhere at some time. And there is an inherent arbitrariness to the starting point, in our case, an exchange on the SERRC website. But this doesn’t mean that it should remain confined to this exchange or to the two parties engaged in it. As always, in the spirit of Popper and Rorty, the postmodernists and secularists, we endorse a built-in invitation for anyone who wishes to contribute and participate here or elsewhere. This is exactly the kind of democratic dialogic we both adhere to. Agassi, Joseph. Science and Society: Studies in the Sociology of Science. Dordrecht, Boston: D. Reidel Publishing Company, 1981. Benesch, Philip. The Viennese Socrates: Karl Popper and the Reconstruction of Progressive Politics. New York: Peter Lang, 2014. Berman, Elizabeth Popp. Creating the Market University: How Academic Science Became and Economic Engine. Princeton: Princeton University Press, 2012. Greenberg, Daniel S. Science for sale: The Perils, Rewards, and Delusions of Campus Capitalism. Chicago: The University of Chicago Press, 2007. Kerr, Clark. The Uses of the University. Cambridge, MA: Harvard University Press, 1963. Sassower, Raphael. A Sanctuary of Their Own: Intellectual Refugees in the Academy. Lanham, MD: Rowman & Littlefield Publishers, Inc., 2000. Sassower, Raphael. Popper’s Legacy: Rethinking, Politics, Economics, and Science. Montreal: McGill-Queen’s University Press, 2006. Sassower, Raphael. The Price of Public Intellectuals. Hampshire: Palgrave Macmillan. 2014. Savage, James D. Funding Science in America: Congress, Universities, and the Policies of the Academic Pork Barrel. Cambridge: Cambridge University Press, 1999. Veblen, Thorstein. The Higher Learning in America. New York: Wang & Hill, 1957/1918.